Workforce gave Sir Michael Stoute his fifth success in the Investec Derby at Epsom with a brilliant performance under Ryan Moore. Many hoped a new star would emerge in this year’s Investec Derby and 6/1 shot Workforce proved just that as he stormed home to finish seven lengths clear of 100/1 outsider At First Sight. It was a fifth win in the premier Classic for trainer Sir Michael Stoute as Prince Khalid Abdulla’s colt scored in a time of 2 minutes and 31.33 seconds, beating the previous race record set by Lammtarra in 1995. Champion jockey Ryan Moore, who won a first British Classic 24 hours earlier on Snow Fairy in the Investec Oaks, became the first rider since Kieren Fallon in 2004 to win both Epsom Classics in the same season. “He was seriously good today,” said Stoute. “He’s got a great temperament and I’m thrilled for Prince Khalid and Ryan, who always had a lot of confidence in the horse. “They seem to get sweeter as time goes on, it feels better every time! I’d like to sit down and watch it again later on but it was an exhilarating display. “The thing about horses beaten in the Dante not winning here was a rubbish statistic and that didn’t bother me. “Things didn’t go right for him earlier in the year because I’d wanted to give him two races beforehand and then things didn’t work out at York. But that doesn’t bother me now. “I was under no pressure to run him here and wouldn’t have run him unless Ryan and I thought he had a real chance. “The Dante run didn’t go as we wanted - it was unsatisfactory - but he was seriously good today, wasn’t he? • Workforce won today in a course-record time of 2m 31.33s - beating the previous record of 2m 32.31s set by Lammtarra in the 1995 Derby. • Sir Michael Stoute is now the most successful current trainer in the Investec Derby with five wins - Shergar (1981), Shahrastani (1986), Kris Kin (2003), North Light (2004) and Workforce (2010). Henry Cecil is next best with four victories. The all-time record is seven victories, achieved by Robert Robson, John Porter and Fred Darling. • It was a third Investec Derby victory for owner Khalid Abdulla following Quest For Fame (1990) and Commander In Chief (1993). The most successful current owner in the Investec Derby is the present Aga Khan, who has enjoyed four wins. • The seven-length victory achieved by Workforce today is the third greatest margin of victory in the Investec Derby’s history. Troy in 1979 and Slip Anchor in 1985 also won by this margin. The largest winning distance was 10 lengths, set by the Stoute-trained Shergar in 1981. • Ryan Moore is the first jockey to win the Investec Oaks and the Investec Derby in the same season since Kieren Fallon in 2004. Ryan Moore was delighted to complete the Investec Oaks/Investec Derby double and said: “To me it’s the most important race, it’s a special day and it’s been really nice to get a great reception from my family, friends and weighing-room colleagues. “He travelled very smoothly and the gap opened up beautifully. He showed great acceleration and I was actually in front sooner than I wanted to be. He quickened up really well and it was a great performance. It’s a long way up that straight. “My horse travelled beautifully. I got a bump at the top of the hill and had to take my time. It opened up beautifully and, when I asked him to quicken, he really accelerated. 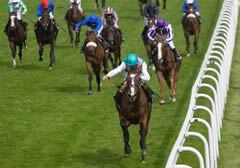 “From the three-furlong pole, he just accelerated and he really showed a good of foot. For a big horse on fast ground on a track that doesn’t suit him, it was a good performance and I just hope that there is more to come. “He quickened up really well and he just kept extending. His stamina and class was enough. He is a real good horse and I am delighted. “I got there earlier than I would have ideally liked on a horse with his style of running and I was a little bit hard on him so I hope that he comes out of the race in good shape. Jockey Ryan Moore will never be a crowd entertainer, but his brilliance in the saddle has given him a growing number of racing fans. After another brilliant ride on runaway Investec Derby winner Workforce, Moore was given rousing applause when stepping forward to receive the winning jockey’s trophy. Of Workforce, who was home-bred by his owner, Prince Khalid Abdulla, and is a son of Darley stallion King’s Best, Sir Michael said: “On the racecourse he’s always looked brimful of promise, and he won his first race very easily, but things have been a little bit frustrating this spring. He’s a big fellow and it was cold and he wasn’t thriving in it - he had a dirty scope and it got us behind a tight schedule. The Derby is a tight schedule. That said, he’s a very straightforward horse and very laid back. “We knew the Dante Stakes [in which he was second] had pulled him together a lot and Ryan was very confident about the horse after we took him to Lingfield [for a pre-Investec Derby gallop] and he cornered so well. “We’ve paid a lot of attention to the horse and there’s been a lot of teamwork, but so much depended on the work out at Lingfield. From Ryan’s point of view it was important that the horse went downhill and tight left and he really gave him a squeeze coming down the hill. Teddy Grimthorpe, racing manager to Prince Khalid, said: “It’s been a long time since the Prince’s last Derby winner, which was Commander In Chief in 1993, and he’s absolutely chuffed. When Ryan got off the horse after the Dante Stakes he said, ‘don’t be disappointed, because I’m not’ and that gave us a lot of confidence. “I always talk to Sir Michael before making plans for the horses, but you don’t need to be a clairvoyant to see that the Irish Derby would be a logical race for him. Despite fielding three runners, including the 9/4 favourite Jan Vermeer, Investec Derby glory eluded Ballydoyle trainer Aidan O’Brien but only just: his runners finished second, fourth and fifth, with 100/1 outsider At First Sight, essentially performing a pacemaking role, setting a fierce gallop and staying on well to grab the runner-up spot seven lengths behind Workforce, who won in course record time. Ridden by Seamie Heffernan, At First Sight was well clear of the chasing pack turning for home until champion jockey Ryan Moore unleashed Workforce whose decisive move changed the face of the race within a matter of strides. The Mahmood Al Zarooni-trained Godolphin runner Rewilding took third, finishing just half a length behind the runner-up.